Rafa Nadal in DEUCE "The Good Fight"
Ever-sensitive Rafael Nadal admits he is a reluctant warrior at times, but also finds that the battle - more than winning alone - gives him the greatest satisfaction. Read Rafael Nadal’s recently published biography – rather unimaginatively titled Rafa: My Story – and one of the first things you’ll notice is that he often cries. As great a champion as he is, Rafa has had plenty to be weepy about during his 25 years: those glorious moments, the troughs of despair (Do you remember his distress at Wimbledon this year when, in the fourth round, he thought he’d damaged his left ankle? ), the profound sadness of his parents’ marriage breakdown two years ago, the highs and lows that beset any warrior. Yet throughout it all his most valuable personal traits have remained constant: utter fearlessness on court and chivalrous niceness away from it. Despite the thousands of miles he has travelled, the thousands of hands he has shaken, the thousands of interviews he has given, the thousands of vicious winners he has struck, those basic elements of the Spaniard have never changed and never will. One is often asked: “Is he really as nice as he seems?” The answer, quite simply, is “Yes”. He remarks that his parents, Sebastian and Ana Maria, were always very strict with him as a child, telling him to remember his pleases and his thank-yous, and to sit up straight at the dinner table, and not to talk with his mouth full. Well, we all attempt to do that with our children, but it doesn’t always work out. To keep true to those tenets when people worship you and fall at your feet is not easy. Put yourself in his shoes (which he never puts on without untying the laces first) and imagine wrestling with the demands of being the No. 1 sportsman in your country and maintaining the discipline and single-mindedness required to succeed in a sport like tennis. Of course, everyone can relax away from the spotlight. To get a true insight into what Rafa is like you need to witness him playing his beloved golf. He treats this sport as seriously as any set of tennis, and has frustrated many a golf partner by insisting on searching interminably for a lost ball. Even for friendly rounds he has to be fully prepared. Last year in Indian Wells, for example, he was about to tee of with his occasional coach Francisco Roig and the former Roland Garros finalist Alex Corretja when, suddenly, he leapt back into his buggy and disappeared back to his hotel. With the exasperated course starter looking at his watch and threatening to cancel the tee time, the buggy came thundering back into view. 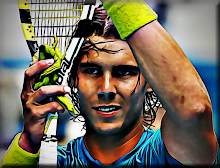 Rafa had returned with the tips of all his fingers bandaged, just the way he does for tennis. Ever the perfectionist, he simply couldn’t have played without this strapping. But these are the times of freedom, when Rafa can escape the confines of what he does for a living. Tennis is a mean business, especially at the very top, where Rafa has resided for several years, including 88 weeks as the World No. 1. He has won 10 Grand Slams, completing the full set at the US Open in 2010, and he has lost in four other finals, most recently to Novak Djokovic. While 2011 is undoubtedly Djokovic’s year of all years, the man who has pressed this Serb harder than anyone else has been Rafa. Djokovic is now the Spaniard’s most distinct nemesis – an enemy of sorts, though Rafa could never bring himself to say the word. After the US Open in September, when Djokovic won in four gripping sets in what many considered one of the top five matches of the past 30 years, Rafa said the following: “I didn’t feel any obligation to win the tournament. I am not one that feels that [only reaching] the final is a bad result. I don’t consider myself that good. I fight to be always there. I fight all the time to win every match. I appreciate the result. [Reaching] the final is a fantastic result. It’s smart to accept the losses with the same calm as the victories, and to keep working without thinking on the past. Whether he’s piecing together the reasons for a loss; or rejoicing in the love of victory, after which comes the downtime when he wonders if he can possibly do it again, Nadal speaks freely of moments when doubts have assailed him. In the next couple of weeks, as he spends Christmas at home with his family in Manacor, a peaceful retreat on the island of Mallorca, he will take himself off to think about the tests to come. This story also appears in the official Barclays ATP World Tour Finals tournament programme. The Entire Article on a ScreenShot if anyone would like to pass it around.